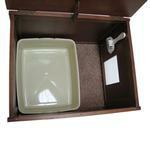 Give your cats some privacy and keep your place nice and free of the litter box look! 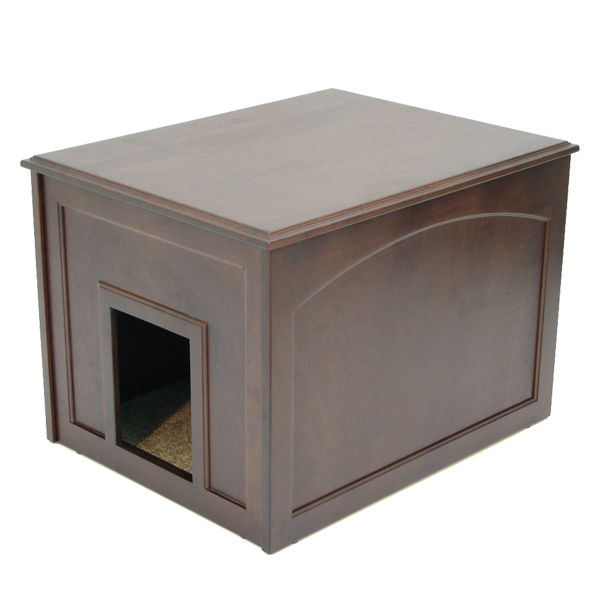 The Crown Pet Cabinet is a decorative yet functional enclosure designed for the convenience of the pets and owners alike. 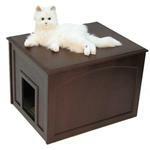 Used as a Cat Litter, it combines a litter box and lounge top for kitty, all in one luxurious piece of furniture! Use without the litter box and it can be used as a retreat for cat or a doggy den to snuggle in. Stylish it can be used as an end table, which adds to any room, while conserving space and providing essential amenities for your pets.The top can be opened easily on hinges and a spring loaded hinge will hold it open if needed. The melamine MDF floor eliminates absorption of liquids and odors and is easy t clean. The removable floor carpet keeps cat litter and dust contained. Crown Pet Products design high quality, furniture grade cabinet to have a minimal impact on the environment while making pets happy. Constructed of Eco-friendly Rubber-wood which minimizes cracks and shrinkage and is highly durable. Very good service fast delivery! Very well satisfied with product and this site.